Sattvik Sensibility is the phrase to describe the meeting with 60 year-old Narayanan Rao and his family. It was an insight into how India’s spiritual heritage has been nurtured by devotees across eons. As a family, they have dedicated their life to preserving their religious traditions. Religion to them seems to be a way of life and, oblivious of globalisation and changing times, this family seems to live by their own stringent rules. For me, this was a challenging interview because when one’s religiosity is so deeply embedded in tradition, questions about modernity and changing times become superfluous. Even though Narayananji’s children have travelled in pursuit of higher studies, their value systems and way of life are rooted in their religious upbringing. He speaks chaste Tamil and was patient with my broken sentences, willing to repeat his answers as well as allow his brothers to explain the details in layman’s terms for my understanding. Namaste Narayananji, tell me about your origins. We are Madhva Brahmins who are originally from North Karnataka. Our main deity is Raghavendra Mrittika Brindavana. Five centuries ago, our ancestors moved to Salem and the following generations have accepted this city as home. My father, S.T. Ramachandhar Rao was in the catering business. My grandfather was a teacher but he became a head cook later. Our family members have also always trained to become priests. Religion is the prime aspect of our life. We have always taken care of our temples and spent time studying the scriptures. Yes, we recently built a temple nearby, popularly known as the Kannankurichi Raghavendra temple. We take care of the temple completely – from maintaining it, and preparing the prasadam to conducting the Pujas. And I would like you to know that we carried the deity from Manthralayam. You carried the deity all the way? Tell me more. 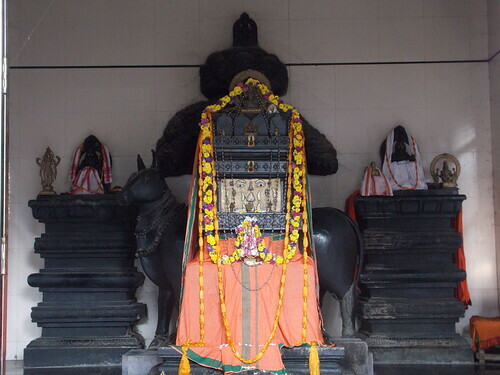 The Mrithika (deity) of this temple is from Manthralayam which is around 1000 kms from Salem. As a family, we walked this entire distance carrying the deity. It took us almost 12 days to complete the journey. Did you follow any rituals during the journey? Yes, we would begin the day with a puja in the early hours of the morning. We would then start walking at 5 am. At around 10 am, we would stop at a spot where natural water source was available. We would then perform the main pooja and make the offering, known as Asthotaka, to the deity. After lunch, we would rest for an hour. At around 3.30 pm, we would begin to walk again and continue till 9 pm. Any one of us would carry the deity for a kilometer before handing it over to another. How did you manage such an ardous journey? The enthusiasm was really high and the rituals bound us all together. A couple of people travelled in vehicles and they would go ahead and search for the spots where we could stay in the afternoons and nights. Any clean place, preferably temples, is ideal for this. The cooking vessels and other necessities are carried in the vehicles. This was the routine we followed throughout the journey. What is the special celebration in this temple? During the month of August, an annual celebration known as Aaradhana Mahotsava is celebrated for three days. This event takes place in every Raghavendra Brindavana across the world. On this occasion, our trust undertakes all important tasks such as Abishekam (bathing the deity) and Archanai (worshipping the deity). We also take care of the Annadana (offering of food) for all the devotees who visit the temple. This event attracts over 1000 people, from far and wide. Do you follow a strict life style and undertake religious fasts? Yes, the routines are fairly fixed. Waking up early is a must. Pujas and fasts are part of our life. From the age of eighteen, I was expected to undertake fasts. On the day of ekadasi, the entire family is expected to fast. It is quite rigorous, almost like your Jain fasting. We are not even allowed to swallow spit on that day. I understand that you are also in the catering business? Yes, we are eight brothers of which five of us are in the catering business for the past seven years. My brother Gokul is an independent caterer while the other four work along with me. Our catering company is known as “Narayana Rao Brothers”. Yes, but my brother Gokul is a better cook than me. He also caters at a bigger level. At a recent celebration at the Kumbakonam temple, he undertook a catering order overnight and cooked for two lakh people. Do you travel as a family? As a family we go on pilgrimages, and visiting holy places is important to us. Most of our life’s activities revolve around spirituality. What about your children? I am sure the impact of globalization must have had its impact on them, however strong their samskaras may be! The children follow the systems quite strictly. I have two sons and one daughter. Once the boys get married, the daughters-in-law are expected to do the same, which they comply with. Has the next generation branched into different professions? Yes, education is important. In the next generation, we have bankers and software engineers, but when they come home, they all follow the rules. They wake up in the morning and do their prayers. All of this is part of their upbringing. You may be surprised to note that none of them have travelled abroad even for education. That is considered ‘nishiddha’, meaning banned. Not really! We don’t encourage that since food is greatly connected with our thoughts and desires. It is important to ensure that our food is sattvik and instills sattvik sensibility within us. Most places have our Raghavendra Madams, so we stay and eat over there when we travel. First published in February 2015 in Harmony – the Indian magazine for silvers for the column – ‘His Ladle Love’. A series about men who experience the joy of cooking and can weild a deft ladle in the kitchen. Part-2 of this post is the recipe of Bisi Bele Baath to be published soon.